So to remember, we call it by the acronym ADAPT. Organizations go ahead with it like a Pilot project, like selecting few team members and implementing Scrum with them, It’s a ‘Start Small’ pattern. The other approach can be Go All In, which is like the executives are convinced and want the whole organization to implement in one go. The All-in transition is Quick! As recommended by Mike Cohn, one should always Start Small! It involves less cost and guaranteed early success. Going all in should be in limited cases, only when it’s a quick need. Also, it involves more cost/money as there are a lot of changes in different departments if required. The next pattern that comes into the picture is whether to Publicize it or not. We can do the Public Display of Agility. In this approach, the organization announces that it is adopting Scrum. This can vary from announcing it in a meeting room to announcing it through the press release. The other approach is Stealth transition. In this, only team members know they are using Scrum until the project is complete. As recommended by Mike Cohn, always choose to make a public display of Agility when you are confident and committed to the transition and when you expect a lot of resistance but want to overcome it quickly. In contrast, choose a quiet approach, when you want to do an experiment using Scrum. Getting started with Scrum is one thing, spreading it across the organization is another. Unless you choose an all-in transition, you will need to build upon the successes of the first few teams as you move Scrum to other teams. There are 3 general patterns given by Mike Cohn that talks about spreading Scrum. This talks about taking a team that has begun to be successful with Scrum and using its team members to seed new teams. It’s typically put to use after the first few teams have successfully implemented and adopted Scrum. By this time, each team member understands how Sprint work and how the ready software is delivered at the end of the sprint. In Split and Seed pattern, we split one functioning Scrum team into each half of the original team forming the basis of the new team. 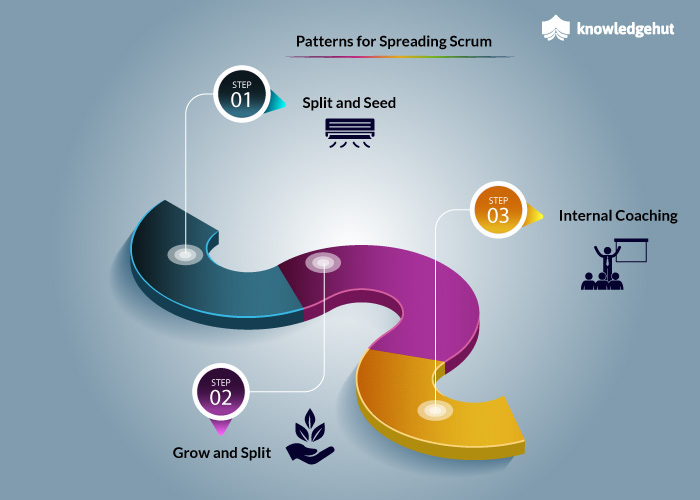 New people are then added to these split teams to form new Scrum teams. A large initial team is used to seed as many as four new teams. Collated below are the reasons to prefer Split and Seed pattern. The Grow and Split pattern involve adding team members until the team is large enough that it can be comfortably split in two. Immediately after splitting, each of the new teams will probably be on the small end of the desirable size ranging five to nine members. After allowing the new teams one sprint at this reduced size, new members are added until each team becomes a large enough that it can also be split. This pattern repeats until the entire organization has transitioned. In following cases, you can prefer to Grow and Split pattern. The Third pattern of Spreading Scrum is Internal Coaching. In the organizations, there include types of teams. Some teams excel with the new agile approach, while others struggles. On each team, there exists one identified person who understands and implement Scrum successfully. That person is assigned as a Coach for other teams. Coaches were given responsibilities to attend sprint meetings, daily scrum each week and coach other teams. In general, consider going with Split and Seed pattern, when in a hurry. It is the fastest way of spreading Scrum. However, if the technology doesn’t support moving people among teams, changing the team members can affect the productivity. The Grow and Split pattern is simply more natural and direct approach. Consider using this approach if there is no sense of urgency as it is less risky. Internal Coaching can be used on its own, mostly when the group is large enough and when splitting teams are not possible for the projects.